Summer time is here! In some parts of the world (especially Eastern Europe), it’s already so hot you can barely stroll without thinking of taking a cool bath at home or, why not, in some luxurious swimming pool. It is believed that the first swimming pool was built in modern day Pakistan, at the Mohenjo-Daro – it was called the Great Bath. It’s also thought that the Great Bath was dug during the third millennium before Christ. It measures 12/7 meters and is lined with bricks while covered in a tar-based material. Ancient Greeks and the Roman Empire also built artificial pools. They served for many purposes, including training, water games, and military exercises. Today we are going to present you with ten great swimming pools. Enjoy! Starting our list of great swimming pools is the infinity pools found at the Villa Mahal. It is recognized as some of the most beautiful swimming pools in the world thanks to its “infinity” design – meaning that it gives you the illusion of a pool that’s dropping from the sky. The Atlantis Resort is a haven for those of you who are passionate about sailing. Their harbor host yachts of up to 220 feet long, not to mention the huge sized pool which features numerous fun attributes, such as slides, waterfalls, grottoes and much more. The Perivolas Luxury Hotel is one hotel that has luxury spelt all over it. It is placed on the most beautiful village on Greece’s romantic island, Santorini. 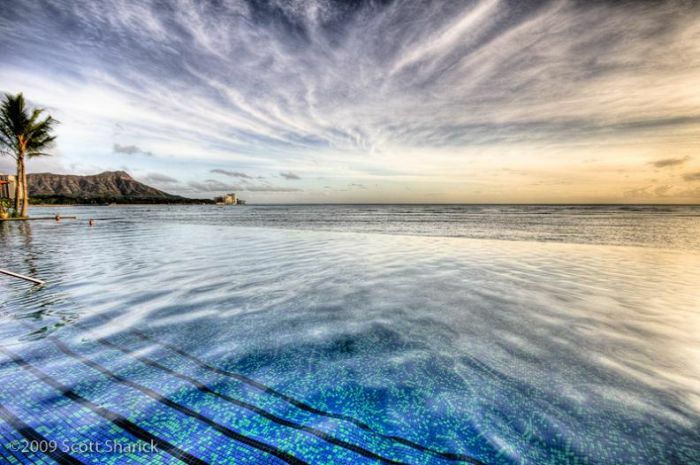 Their infinity pool is often regarded as the most famous hotel pools in the world. The view is simply breathtaking. Although our next addition may look like a small and unimpressive pool, it’s most definitely not. Besides being placed on the popular Zighy Bay – Oman, the infinity pool features private beach sections, cabanas and other pools, and a whole lot of luxurious resorts. The Four Seasons in Costa Rica is a luxurious resort which offers amazing adventures for anyone. In addition to the superb beaches, restaurants and relaxation services, you can find a great infinity pool at the Four Seasons Hotel. The Mandarin Oriental Hotel in New York City offers an amazing view over the Central Park and the Manhattan skyline, placing it as one of the most luxurious hotels in NYC. Their pool is a source of relaxation, offering both the benefits of swimming in a controlled environment and the beautiful view of the city which never sleeps. 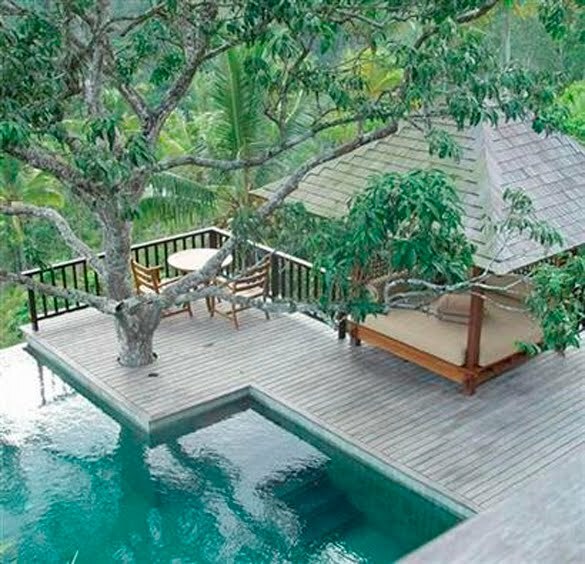 Next in our list of ten great swimming pools is the modest but not without beauty villa style hotel. Its outstanding view gathers millions of people from around the world, in addition to the excellent pool services in enables. Pack your bags and go for the ride of your life. If swimming in this particular pool does not satisfy your needs, don’t worry, because the Golden Nugget still features several point of attractions, such as the salt-water aquarium with fish and sharks, amongst other entertaining activities you can experience. When it comes to luxury and well fair, there are few cities in the world that could compete with probably the most extravagant cities in the UAE (United Arab Emirates). So if you’re thinking of dipping your toes in one of the most expensive swimming pools around, consider the Burj Al Arab swimming pool. We finally reached our number one choice in this list of ten great swimming pools. 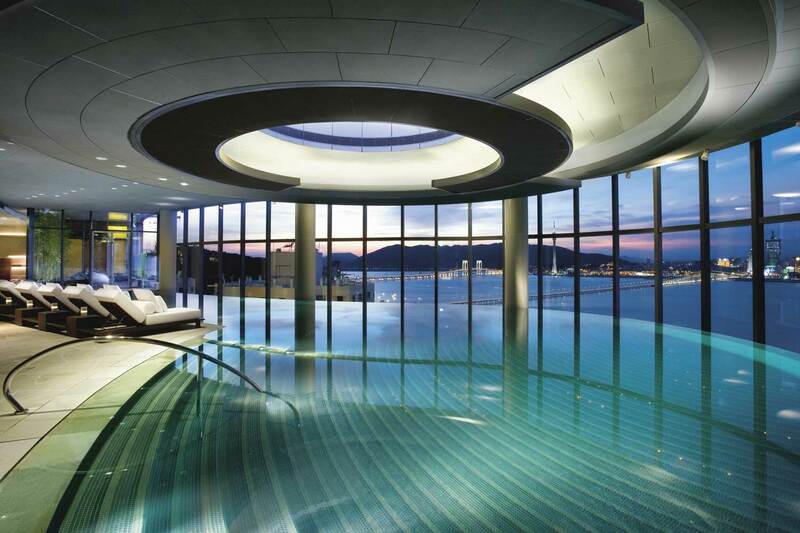 Number one in the list is the Crown Towers Hotel in Taipa – a cool looking pool that looks over an outstanding skyline from high up. So, if you want to enjoy the most amazing sunset you’ve seen so far, don’t be shy and visit this resort.